It's something to get an audio restoration engineer's heart beating a little faster than usual - a specialist music software company in Germany announces a cure for wow and flutter. Not perhaps on a par with a cure for cancer, of course, but as they say themselves: "For over 100 years, music has been recorded on mechanical storage mediums, and for over 100 years such recordings have been plagued by the same problems: wow and flutter". After lengthy research and development, and building on revolutionary technology which already allows phenomenal feats of musical editing from within a recording, such as re-pitching, moving, lengthening or otherwise altering an individual note or chord despite it being apparently locked into complex polyphony, Celemony finally this week released their Capstan software. It is "for the first time a program capable of removing wow and flutter from musical recordings", as they put it. I've been working with their Capstan specialist Mathis Nitschke over recent weeks, sending him part-restored piano sonatas from the Schnabel recordings for him to work his incredible wow-and-flutter magic on, and early last week I was finally allowed to get my own hands on the final release product itself, a week ahead of general issue. 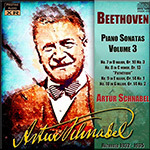 It's given me a little time to experiment, tweak, and generally find out how this new software works, what it can do, and where its strengths and weaknesses lie, as well as put it to good use for this week's releases - and update our previous Schnabel sonata volumes. In operation everything seems remarkably simple, with the bulk of the power kept firmly "under the hood". When you load up a sound file into Capstan it takes a while to think about it - a full length CD completely maxes out my PC system's fast four-core processor for maybe 15-20 minutes. This is the clever bit, it seems - Capstan is performing zillions of high-speed calculations to untangle and analyse all the notes and their various harmonic frequencies, working out what it thinks are intentional pitch fluctuations - vibrato - and which are undesireable - wow and flutter. At the end of this process the user is presented with a waveform and pitch analysis on the screen, and given two basic controls in order to "drive" the processing. Each acts as a kind of accelerator/brake - one controls the degree of pitch alteration, the other the 'jaggedness' or resolution of that change, allowing you for example to smooth out what the machine thinks may be flutter but which should be heard as legitimate vibrato. It sounds simple, and in essence it is for the operator. But to continue the motoring analogy, it's also a powerful vehicle capable of inflicting damage or careering off road unless carefully driven. The automatic detection can be sidetracked or find itself a little confused, and I'm no more ready to let a computer make these kind of musical decisions than I am to let it drive me to the supermarket. So while for much of the time I go along with Capstan's expert judgement, from time to time I'll have to intervene. Sometimes it struggles with very quiet single notes played over a hissy or noise background - which occurs more than once in the current Schnabel sonatas release; at other times a bump or the barely-audible remnants of a click will confuse it too. On material dominated by vocals it needs considerably more reining in than necessary on a piano recording - in my murky, distant past I played keyboards on a music demo by the now-comedian, TV and film star Ricky Gervais, a slightly mangled cassette of which I've managed not to lose in the intervening 23 years but which has always suffered pitch wobble from being copied from tape-to-tape back in 1988. Out of curiosity - and because the content was so sonically different to the Schnabel, I ran this through Capstan and quickly realised how much more intervention this kind of music needed. The software often picked up on the powerful lead vocal 's pitch inflections and tried to take the rest of the music with it, requiring a dab on the 'brakes' from time to time. But so far, so good. I think it's done amazing things to the Schnabel piano - you'd want it to if you were paying nearly $4500US for a single new step in your remastering process - and it helps me in a number of other ways, with accurate pitching being a fundamental requirement of XR remastering. And of course it is only another tool - albeit a revolutionary one (in more ways than one!) in the remasterer's armoury. It may offer a cure to one problem inherent in historic recordings, but as my wrestling this week with some of the less-well-preserved sides of Schnabel's Beethoven reminded me, it still leaves a lot of what I regard as more routine cleaning up and restoration still to do! In the present Volume this is most beautifully played, and the realism of tone is also remarkable. "...The Sonata in D major, Op. 10, No. 3, was composed two years later than the C minor Sonata. It is in every way a superior work, and in my opinion Beethoven never wrote a more perfect movement than the Largo e mesto movement of this Sonata. In the present Volume this is most beautifully played, and the realism of tone is also remarkable. There is a very short minuet and a finale that is full of the characteristic humour of the composer. Eric Blom remarks that 'charm and abruptness contend with each other in giving us the impression of a wilful and quick-tempered but warm-hearted personality.' The reader who hears these records will endorse this view..."